If you need a to drain or move a large quantity of water, you’ll need one of our high flow water pumps. These pumps are all chosen for their high flow rates, which allow large sites to be drained or flood water moved quickly. They are impressive high-flow water pumps, making them perfect for dewatering. In this range we have both engine pumps and submersible pumps. The engine pumps are petrol or diesel. 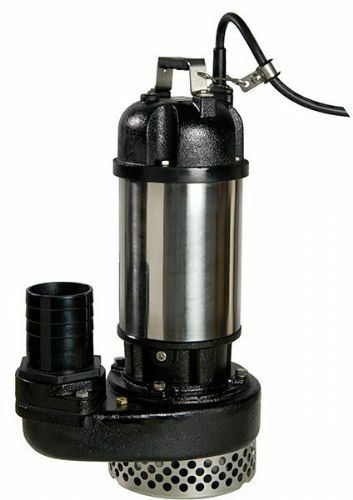 The submersible pumps are available in 110v or 230v. It is important to consider if there will be a power supply, or if not – an engine driven pump may be required. A popular submersible pump, the APP BPS200, has a flow rate of 140ltr/ min, whereas the submersible pump in this range, the APP HD15 has a flow rate of 830ltr/ min, meaning that although these pumps are the same brand, the HD15 flow rate is around 5 times higher than the BPS200. In the engine driven range, the popular Honda WX10 has a flow rate of 142ltr/ min, whilst the TED100RD has a flow rate of 2000ltr/ min. This is a massive difference which means the same job can be done fourteen times quicker! Why Would you need a High Flow Pump? Higher flow pumps are generally used on large scale operations such as construction sites, draining swimming pools, large ponds, lakes, rivers and a wide range of industrial uses. These pumps can achieve very high delivery rates making them ideal for large masses of water or situations where the water must be moved quickly. They are slightly more expensive than regular engine pumps, however this is because of the job they can do for you. They have a higher litre per minute output so even though the pump itself is more expensive to buy in the first instance, you will get the job done far quicker, saving time and money each time you use it. What Gives the Pump a Higher Flow Rate? The size and depth of the impeller determines the flow and head rate of the pump. The pictures below show a comparison of two different types of impeller. The HD15 has a deep impeller, which is what gives it the higher flow rate. The deeper the blades, the higher the flow. The more impellers in the pump, the higher the head output. As the submersible APP HD-15 Submersible Site Pump is a high flow rate pump, it Is commonly used in industry and for trade applications. They are made from toughened materials such as wear resistant ductile iron and stainless steel, compared with general household water pumps which may be made from plastic. The engine driven pumps are also made from upgraded materials, including carbon ceramic seals, lightweight aluminium pump housings and cast iron impellers. This also means you get maximum performance, without damage when pumping clear and black water usually found on building sites. We're confident you'll find the pump you're looking for, however if you require any further assistance please contact us.